Ready to research your Civil War ancestor from the South? You might assume that a Confederate Civil War soldier is researched in the same way as a Union soldier, but there are some differences. One of the main differences has to do with where pension records are kept and who was eligible to receive a military pension. Keeping history in mind as you conduct your family history research is beneficial as you reconstruct your Civil War ancestor’s life. Below are a few tips for finding the military and pension files of a Confederate soldier. Photo: portrait of Pvt. Edwin Francis Jemison, 2nd Louisiana Infantry Regiment. He served in the Peninsula campaign under General J.B. Magruder and was killed in the battle of Malvern Hill, July, 1862. Credit: Library of Congress, Prints and Photographs Division. One of the first places to confirm your Civil War ancestor’s military service is the free National Park Service’s Civil War Soldiers and Sailors Database website. 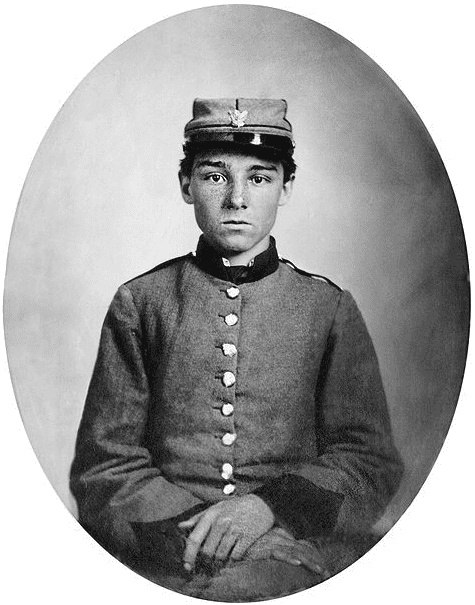 To search for a specific soldier, click on the “Soldiers” tab and then enter his information such as name, state, and side (choose Confederacy in this case). Your results list will provide a name, battle unit, and any alternative names. You can click on your ancestor’s name and you will find a few more details including rank and National Archives microfilm number. 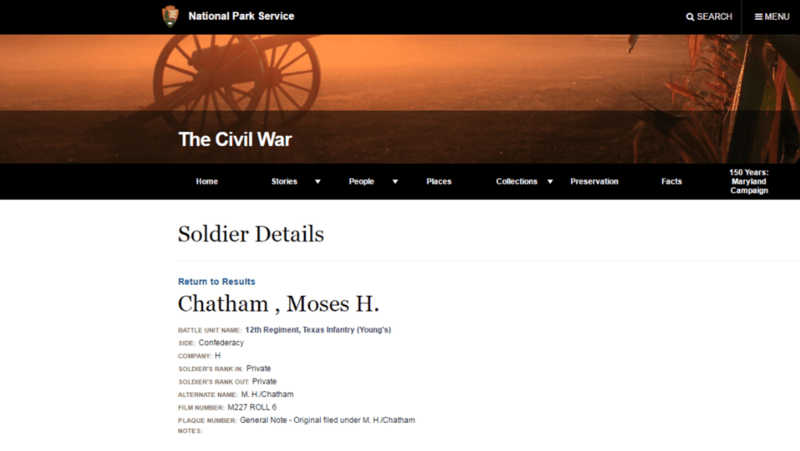 Photo: Civil War record for Moses H. Chatham. Credit: National Park Service. Don’t forget to click on the hyperlinked battle unit name to learn more about your ancestor’s unit. Genealogy Tip: Note the names of other soldiers in your ancestor’s unit. You may find the names of relatives or neighbors. Now that you have found some information about your Confederate soldier, you may want to obtain copies of his military service records. Digitized military service records for both Confederate and Union soldiers can be found on the subscription website Fold3. Access to Fold3 is available through an individual subscription or by using the website at a nearby Family History Center. Please note that Fold3 has other Civil War records as well. You can also order the military records from the National Archives. Pensions were granted differently for Confederate soldiers. 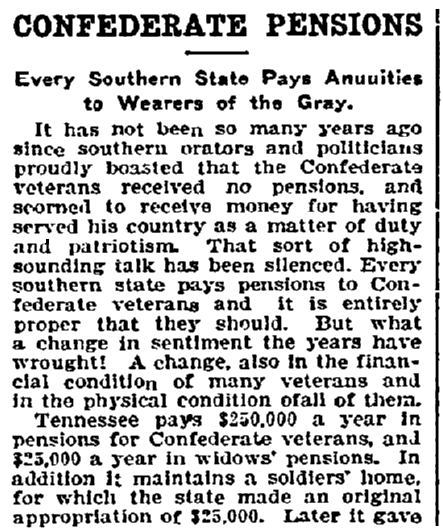 Confederate soldiers did not receive a pension from the federal government. Their pension would have been paid, if available, from the state – but not necessarily the state that they served. They could have benefits from the state they were living in. The following list can be found on the National Archives website** and it provides information about each former Confederate state (and associated states) and their pensions. Records may be found via the FamilySearch Catalog or the applicable state archive. See the National Archive webpage Confederate Pension Records for more information. There’s more to learn about your Confederate ancestor, including what you can find in an online collection of newspapers such as GenealogyBank’s Historical Newspaper Archives. Learn more about researching Civil War ancestors by consulting the book Genealogical Resources of the Civil War Era by William Dollarhide, and the FamilySearch Wiki. * I’m referring to men as soldiers but there were some women who fought in the Civil War dressed as men. ** “Confederate Pension Records,” National Archives (https://www.archives.gov/research/military/civil-war/confederate/pension.html: accessed 23 May 2017).